Spoof email links to a spoof webpage where victim is prompted to enter their details believing the site is genuine. Details are then forwarded to a local script and captured. 1. 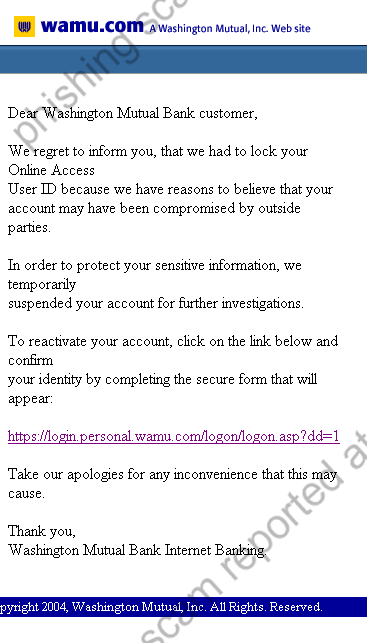 Email claims to be from WAMU asking you to confirm your account data by clicking on the link. You will be taken to a spoof login page where your details will be captured by the phishers. 2. WAMU never send users emails requesting details in this way. 3. URL of spoof website very obviously not WAMU. 4. URL disguised as https://login.personal.wamu.com/logon/logon.asp?dd=1. Looks secure (https), but isn't! 5. Website traced to ROMANIA, Europe.
" 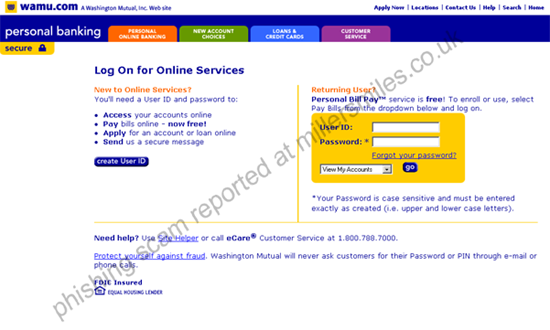 Dear Washington Mutual Bank customer, We regret to inform you, that we had to lock your Online Access"
If you have received this email, please remember that it is very common for these email scams to be redistributed at a later date with only slightly different content or the same but with the fake page(s) hosted by a different provider. Also, once you have received one of these hoaxes, it is also common place to receive at least another one and usually a day or two after the first, although not necessarily from the same apparent sender. Tap into our Scam Alert service using your News Reader or Aggregator (including My Yahoo!). You can even put the latest alerts on your own web site. Latest browser bug aids Phishing Scams - beware! © Copyright 2003-2019 Oxford Information Services Ltd. All Rights Reserved.